Stromatolites growing in Hamelin Pool Marine Nature Reserve, Shark Bay in Western Australia. Author: Paul Harrison. Source: Wikimedia Commons. People come from all over the world to see our Morian Hall of Paleontology, but most of them are so excited to see the dinosaurs that they pass right by the fossils at the entrance to the hall. Those amorphous blocks, seemingly insignificant, are our collection of stromatolites. 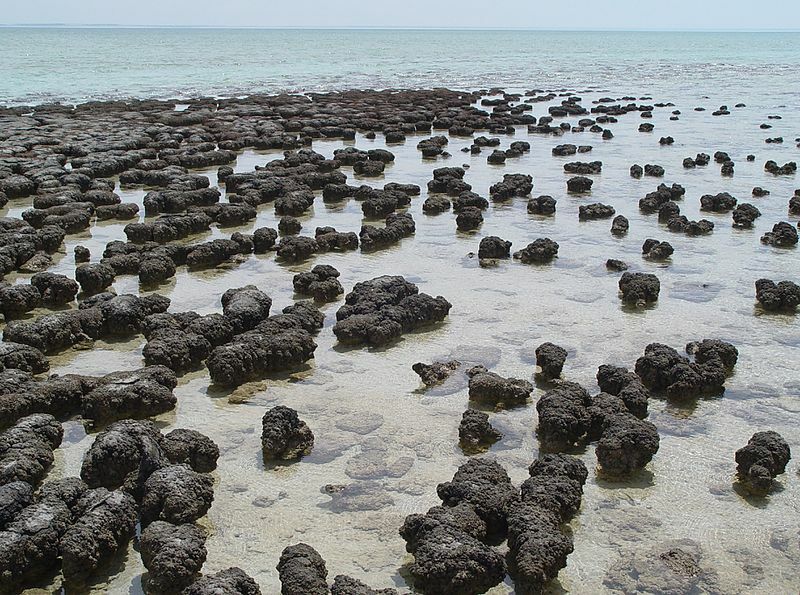 Stromatolites are columnar structures created by cyanobacteria, and they’re very important to the study of paleontology because not only are they some of the oldest examples of fossilized life on earth, going back 3.5 billion years, but they’re also partly responsible for complex life evolving on earth! During the Precambrian era, which extends from 4.6 billion years ago to 546 million years ago, single-celled organisms like cyanobacteria were the only life forms on earth. At that time earth would have been a hostile environment to most of the plants and animals we see today because there were much lower levels of oxygen in the atmosphere. Luckily, cyanobacteria produce their own food through the process of photosynthesis. A byproduct of this process is oxygen.Over millions of years, millions of colonies of cyanobacteria gradually raised the level of oxygen in the atmosphere, paving the way for more complex life to evolve. Sound crazy? Well listen to this: cloroplasts in plants are a symbiotic cyanobacterium that evolved to produce food for the plant in exchange for a home. So not only did they alter the environment, but they helped build more complex life on earth! Millions of years ago, shallow seas all over the world would have resembled the picture above of Shark Bay, Australia. 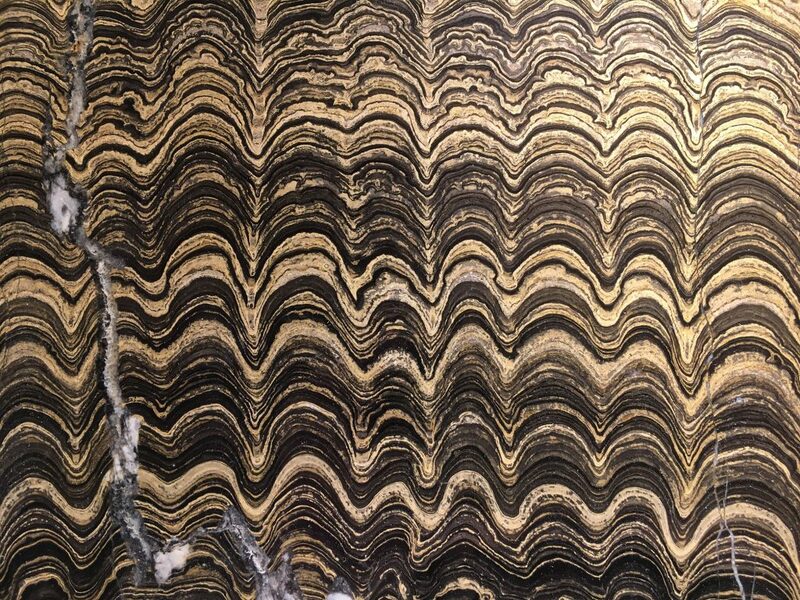 Deposits of fossilized stromatolite structures are found all over the world. The unique pillar shape is created when layers of calcium carbonate form around the bacterial colonies as a result of the depletion of carbon dioxide in the water around the colonies. As a crust of this material forms around the colony, new bacteria grows on top of that crust. After years and years have passed, layer upon layer has built up and these strange, alien looking columns are formed. Close up of the cross section showing the layered construction. Different types of cyanobacteria are still around today, but they only produce stromatolites in a very few locations, like Shark Bay. Paleontologist believe the disappearance of most of the stromatolite “reefs” was due to the evolution of grazing sea animals, like snails, that consume bacteria at a rate which prevents such large structures from forming. These days you only find stromatolites in places that are hostile to most other life forms, in the case of Shark Bay the water is hypersaline. Cyanobacteria are the unsung heroes of the ancient world. Without these tenacious, single-celled, photosynthesizing organisms, the world would be a very different place. 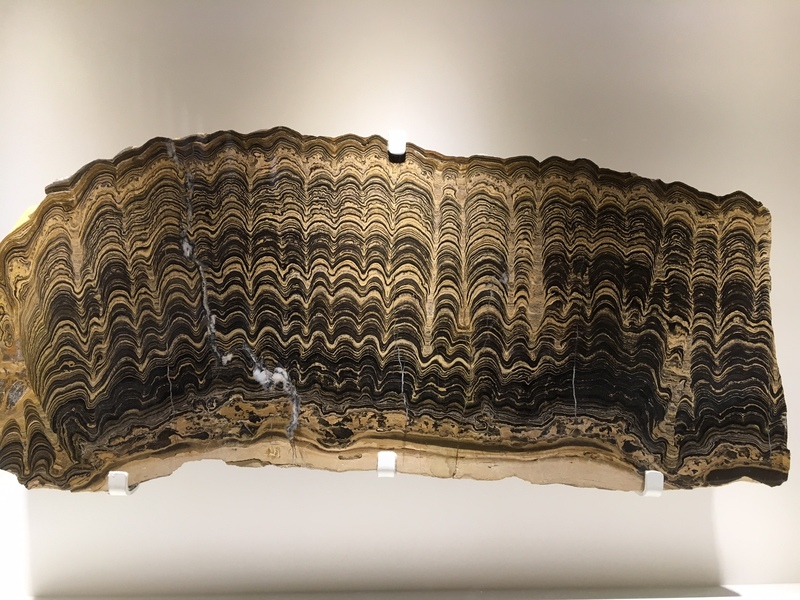 Our stromatolites are a perfect example of how even the smallest, most unimpressive looking pieces in our collection can have an amazing story to tell. Previous Post Ancient Egyptian Gold At HMNS!